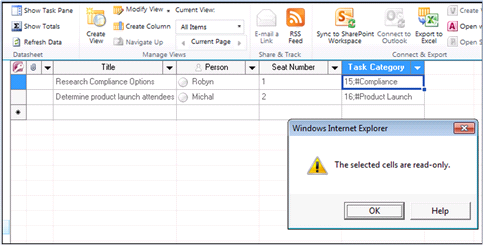 By now we have all heard about the new Managed Metadata features in SharePoint 2010. Most of it is good news, great news actually. However there are some limitations that you should be aware of so that you can make the right choice for your organization. So here is my list of some of the limitations of Managed Metadata Columns. If you have any more let me know so that I can add it and hopefully this can become a pretty good reference for all you good SharePoint people out there! There is no InfoPath support for Managed Metadata columns. Regardless of whether this is an InfoPath form that is hosted through Forms Services or a list form, it is not supported. There is also no support for Managed Metadata columns in SharePoint workspace, as pointed out in a blog from Paul Culmsee. So if you have requirements around taking content offline with Workspace be careful on deciding whether Managed Metadata is right for you. This is another one that gets many organizations. You cannot edit Managed Metadata columns from the Office 2007 client, or 2003 for that matter. If you want to be able to edit Managed Metadata columns you need to have Office 2010 installed. This can be a major pain, especially if you have Managed Metadata columns set to required on a particular Content Type or library. For more information Corey Roth did a great point over at nothingbutsharepoint.com. Go check it out and don’t get caught like many organizations have. You cannot edit Managed Metadata columns in datasheet mode, the selected cells are read only. Therefore for bulk changes you need to either go through each item one by one, or you can also get some of the functionality of bulk metadata changed through Document Sets as I describe in this article. There also seem to be quite a few third party solutions that are making their way on the market to tackle this issue as well. Many people assume that Managed Metadata columns do not work in SharePoint Designer workflows, when in fact they do. However you cannot simply plug in the name of the term that you want to use but need to use the GUID of the term. Yes its not fun, and I am sure that there are cases where this might not work or break. However it is possible but requires extra planning. This was pointed out to me by Kelly D Jones on his blog post entitled SharePoint Managed Metadata Column Limitation. Turns out that you can only have a maximum of 250 terms selected for a particular column otherwise you get an error. Another suggestion, this time from Bobby Chang from a post entitled Beware Local Term Store. When you create a customized Term Set for a Managed Metadata column you will experience issues if you then try to back up and restore it into another content database. This one comes from Andy Burns that talks about why the feature needed to create a Managed Metadata column is not enabled on the blank site template ( you can see it here). Fortunately it is pretty easy to fix, you just have to enable the Taxonomy feature. This was mentioned by Richard Harbridge that you should be aware of the capacity limits around Managed Metadata. 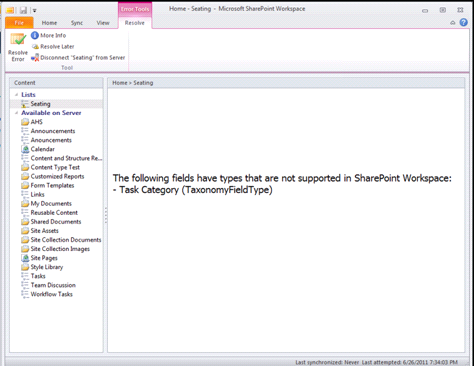 For all of the limits check out the SharePoint 2010 capacity management: Software boundaries and limits TechNet article. Remember if designing for large clients, there are limits to how far you can push the Managed Metadata service. So that’s it for now. Let me know if you have anything to add or alter as I intend this to be a ‘living’ blog post! There are grumblings in the community, let me hear those grumblings!! !